100 reuse envelope labels. In a convenient desk top dispensing box made of recycled material. Keeping envelopes out of landfill. Envelope Angel is a label set designed for re-using envelopes. 100 smart re-address labels consist of a large address label and a sender label that lets the recipient know you are an envelope saviour (not just a skin-flint)! The sender label is just the right size to cover stamps and franking marks so you can easily cover the original postage by turning the envelope upside down and then use the large sender label to cover the original address. 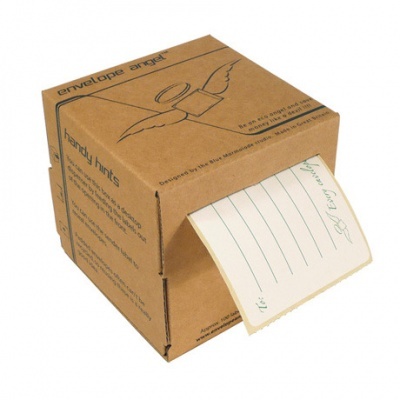 Envelope Angel comes in a sturdy box that doubles as a convenient desktop dispenser. The 100 label sets (address and sender labels) are separated by a perforated cut so you can cleanly tare a set off when needed. The best bit of all is that Envelope Angel is self adhesive, so no licking is required! Ideal for reusing padded envelopes as most are non-recyclable!
. Designed and made in Britain for a low carbon footprint.
. Space efficient, reusable, biodegradable and recyclable cardboard packaging. Made from recycled materials.
. The production of the packaging, product and assembly is all done with in a 80 mile radius to reduce the products carbon footprint.
. Every time you use one you will keep an envelope from ending up in a landfill site.